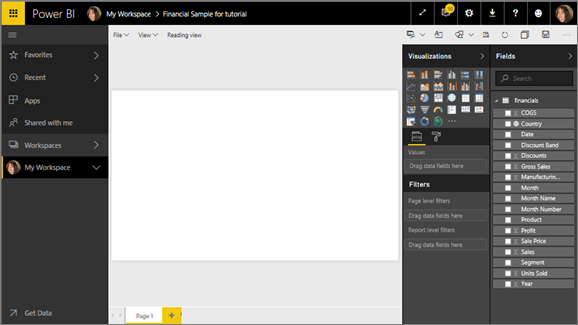 This tutorial helps you get started with the Power BI service. 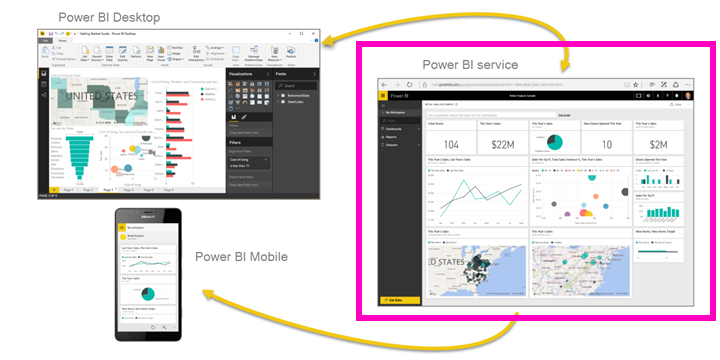 For an understanding of how the Power BI service fits in with the other Power BI offerings, we highly recommend that you start by reading What is Power BI. If you're not signed up for Power BI, sign up for a free Power BI Pro trial before you begin. If you already have an account, open a browser and type app.powerbi.com to open the Power BI service. 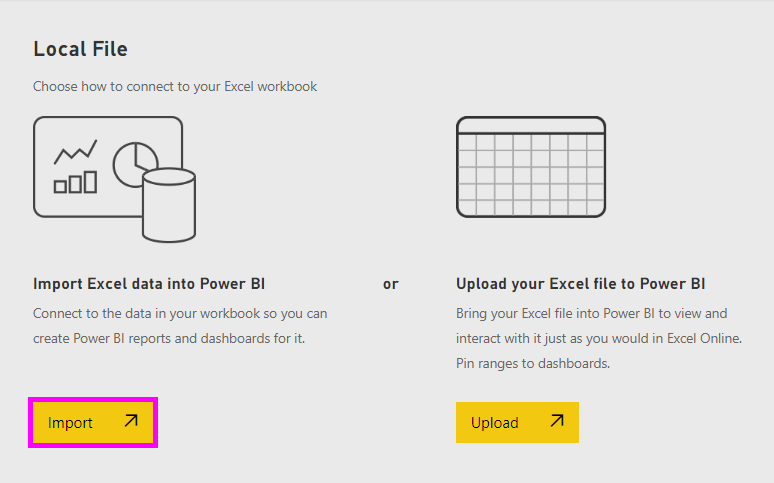 If you're looking for help with Power BI Desktop, see Get started with Power BI Desktop. If you're looking for help with Power BI mobile, see Power BI apps for mobile devices. Prefer a free self-paced training course instead? Enroll in our Analyzing and Visualizing Data course on EdX. The Microsoft Power BI service is sometimes referred to as Power BI online or app.powerbi.com. Power BI helps you stay up-to-date with the information that matters to you. 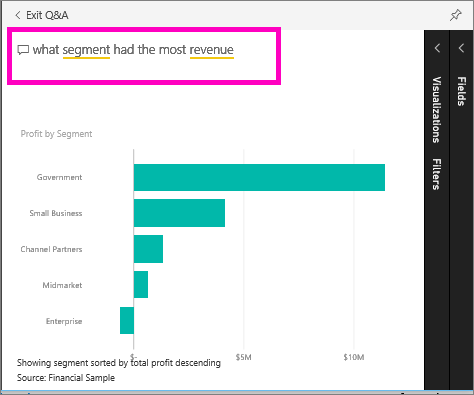 With the Power BI service, dashboards help you keep a finger on the pulse of your business. Your dashboards display tiles that you can click to open reports for exploring further. Connect to multiple datasets to bring all of the relevant data together in one place. Need help understanding the building blocks that make up Power BI? See Power BI - Basic Concepts. If you have important data in Excel or CSV files, you can create a Power BI dashboard to stay informed anywhere and share insights with others. Do you have a subscription to a SaaS application like Salesforce? Get a head start by connecting to Salesforce to automatically create a dashboard from that data, or check out all the other SaaS apps you can connect to. If you are part of an organization, see if any apps have been published for you. 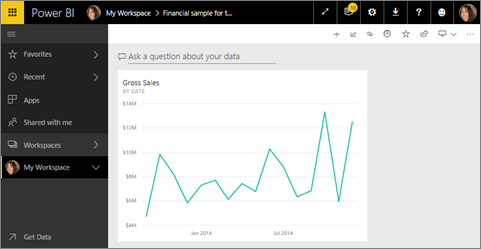 Read about all the other ways to get data for Power BI. Here's an example of getting data from a CSV file. Want to follow along with this tutorial? Download this sample CSV file. Sign in to Power BI. Don’t have an account? No worries, you can sign up for a free trial. Power BI opens in your browser. Select Get Data at the bottom of the left navigation bar. Browse to the file on your computer, and choose Open. If you saved it in OneDrive for Business, select that option. If you saved it locally, select Local file. For this tutorial, we're going to select Import to add the Excel file as a dataset that we can then use to create reports and dashboards. 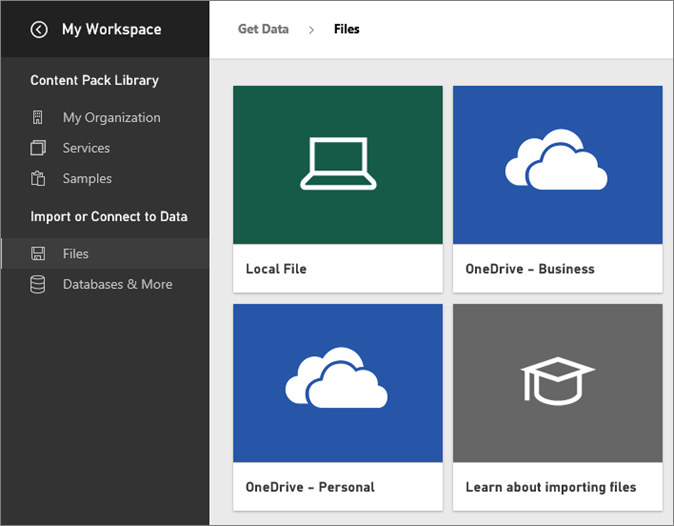 If you select Upload, the entire Excel workbook is uploaded to Power BI where you can open and edit it in Excel online. When your dataset is ready, select View dataset to open it in the report editor. Since we haven't yet created any visualizations, the report canvas will be blank. Take a look at the top menubar and notice that there is an option for Reading view. Since you have an option for Reading view, that means you are currently in Editing view. While in Editing view you can create and modify your reports, because you are the owner of the report; you are a creator. When you share your report with colleagues, they'll only be able to interact with the report in Reading view; they are consumers. Learn more about Reading view and Editing view. Now that you've connected to data, start exploring. When you've found something interesting, you can create a dashboard to monitor it and see how it changes over time. Let's see how that works. In the report editor, we'll use the Fields pane on the right side of the page to build a visualization. Select the checkbox beside Gross Sales and Date. 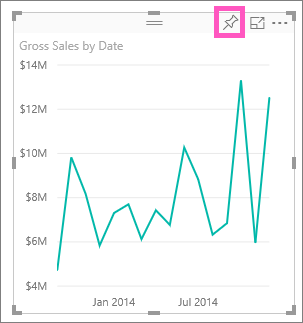 Power BI analyzes the data and creates a visualization. If you selected Date first, you'll see a table. If you selected Gross Sales first, you'll see a chart. Switch to a different way of displaying your data. Let's see this data as a line chart. Select the line chart icon (also known as a template) from the Visualizations pane. This chart looks interesting, so let's pin it to a dashboard. Hover over the visualization and select the Pin icon. When you pin this visualization, it is stored on your dashboard and kept up-to-date so you can track the latest value at a glance. Because this report is new, you'll be prompted to save it before you can pin a visualization to a dashboard. Give your report a name (for example, Sales over time) and select Save and Continue. Let's pin the line chart to new dashboard and name it "Financial sample for tutorial". A Success message (near the top-right corner) lets you know the visualization was added, as a tile, to your dashboard. Select Go to dashboard to see the line chart pinned, as a tile, to your brand new dashboard. Make your dashboard even better by adding more visualization tiles and renaming, resizing, linking, and repositioning tiles. 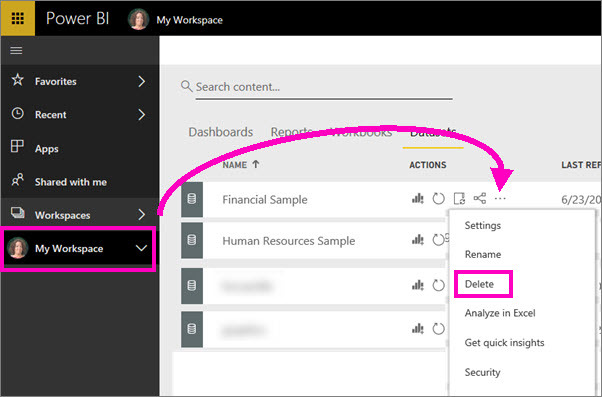 Select the new tile on your dashboard to return to the report anytime. 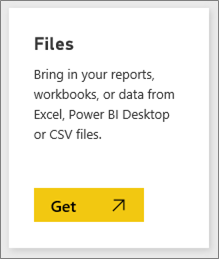 Power BI returns you to the report editor in Reading view. To switch back to Editing view, select Edit report from the top menubar. Once in Editing view, continue exploring and pinning tiles. For a quick exploration of your data, try asking a question in the Q&A box. The Q&A question box is located at the top of your dashboard (Ask a question about your data) and in the top menubar in your report (Ask a question). For example, try typing "what segment had the most revenue". Q&A searches for an answer and presents it in the form of a visualization. Select the pin icon to show this visualization on your dashboard too. Pin the visualization to the "Financial Sample for tutorial" dashboard. Return to your dashboard where you'll see the new tile. Now that you've finished the tutorial, you can delete the dataset, report, and dashboard. In the left navigation bar, select My Workspace. Select the Datasets tab and locate the dataset you imported for this tutorial. Select the ellipses (...) > Delete. Deleting the dataset will also delete the report and the dashboard. Ready to try more? 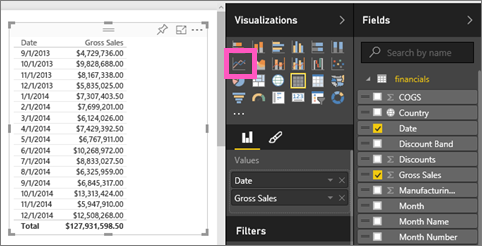 Here are some great ways to explore Power BI.